So here we go again every year when winter hits my Peugeot starts complaining. So basically when it's really cold out and i go to start the car it first starts up great and there doesn't seem to be anything wrong, but after about 30 seconds the engine runs really rough and uneven on idle. At the same time the CEL light starts flashing and when the code is read it's the p1337. But then if i turn the car off and on again everything is back to normal and it doesn't complain until the next really cold start which usually is the next morning. What should i suspect and what can i test? Because i'm in the north of Sweden right now where it's really cold but i'm heading home in 2 weeks which is in the south of Sweden where the isn't as cold. So i need to pinpoint the problem so i can fix it when i get home, since spare parts might be difficult to get up here. Well of course i forgot to mention which car it is... It's a 206 sport 2005 1,6l. P1337 is the camshaft position sensor. If the sensor is not delivering good data, that would account for the rough running. The fact that it only happens on cold start suggests the issue is marginal, so I would first check the cleanliness and security of the CPS connector - maybe a clean with contact cleaning spray (NOT WD40) will help. If not that, you could try a new CPS. They are cheap, and only one small bolt to undo. Otherwise, check the wiring from CPS to the engine ECU - maybe a poor connection. 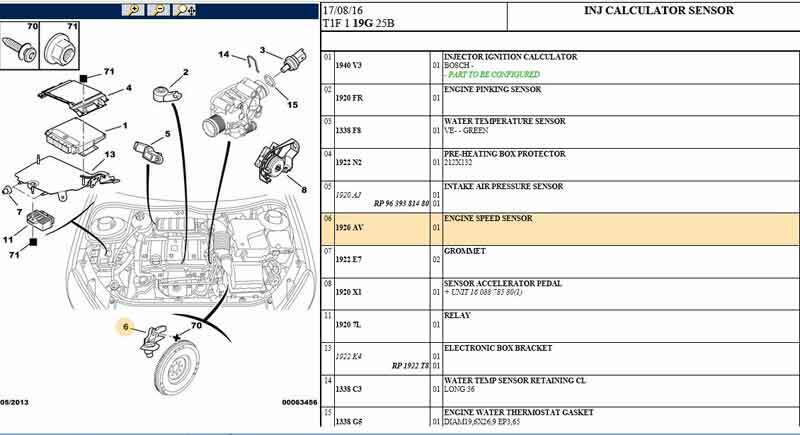 IanL wrote: P1337 is the camshaft position sensor. If the sensor is not delivering good data, that would account for the rough running. The fact that it only happens on cold start suggests the issue is marginal, so I would first check the cleanliness and security of the CPS connector - maybe a clean with contact cleaning spray (NOT WD40) will help. Where can i find the cps on the nfu engine? Okay thanks for the help and info, i'll have a look at it tomorrow to se if there are any signs of damage. Otherwise i'll just order a new one. So i removed the crankshaft sensor to see which one to order and i came across this. The crankshaft is missing some teeth, is this normal? I doubt it's the crank pos sensor. They usually work or not and usually fail when hot. When did it last have a set of plugs? What grade oil are you running? Capncol wrote: I doubt it's the crank pos sensor. They usually work or not and usually fail when hot. When did it last have a set of plugs? What grade oil are you running? No clue, bought the once recommended at the auto parts store, i can check them tomorrow. But shouldn't there be more issues if its the plugs rather than only when it's freezing cold? Depends if the code is true. Not all code readers give a proper code ... I've seen some weird ones with 'off the shelf' code readers and sometimes it needs to be Peugeot specific. Last edited by gazza82 on Mon Feb 18, 2019 10:13 am, edited 1 time in total. Back to basics. If you can get live data from your code reader. Immediately from a cold start, look at the fuel trim, IAT and coolant temp. and let us know readings versus ambient air temp. I suspect it may be a little lean on start up.